The role of an Early Childhood Teacher is to work with students who are in the age group of three to five. The job description of these Teachers is to engage the kids in various activities that will make them enhance their well-being. The other duties that are successfully fulfilled and mentioned on the Early Childhood Teacher Resume include – teaching young kids how to use washroom, wash hands, eat food, and how to dress on own; developing a schedule that emphasizes on rest time and outside play time; ensuring safety of equipment and materials used by the children, disciplining kids, planning and implementing lesson plans, and addressing to cultural or special needs of the kids. Early Childhood Teachers need to be highly communicative and have the potential to be comfortable in opening up and shooting questions, they should be friendly and have the ability to understand the psychology of kids. To fulfill this responsible role, candidates should possess a Degree in Early childhood Education and show relevant work experience as well. 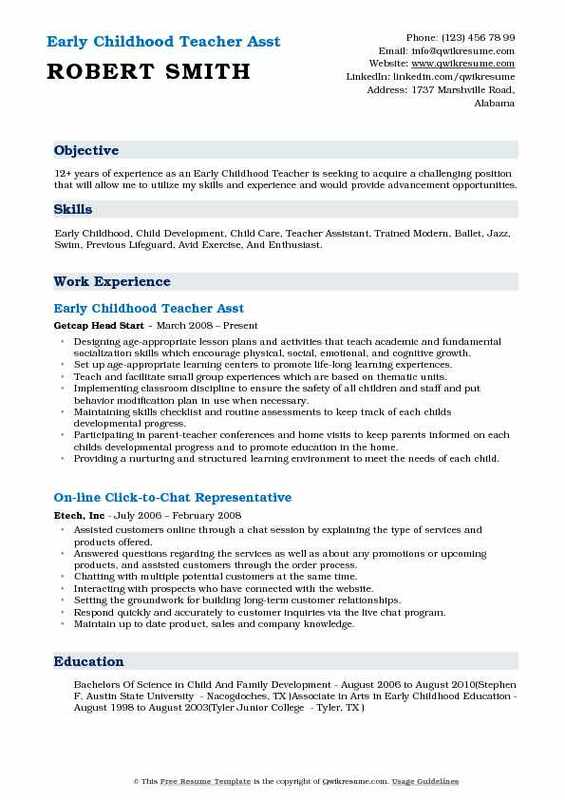 Summary : 8 years of experience as an Early Childhood Teacher. Seeking a rewarding and challenging position that will utilize my skills and can influence the needs of your organization. 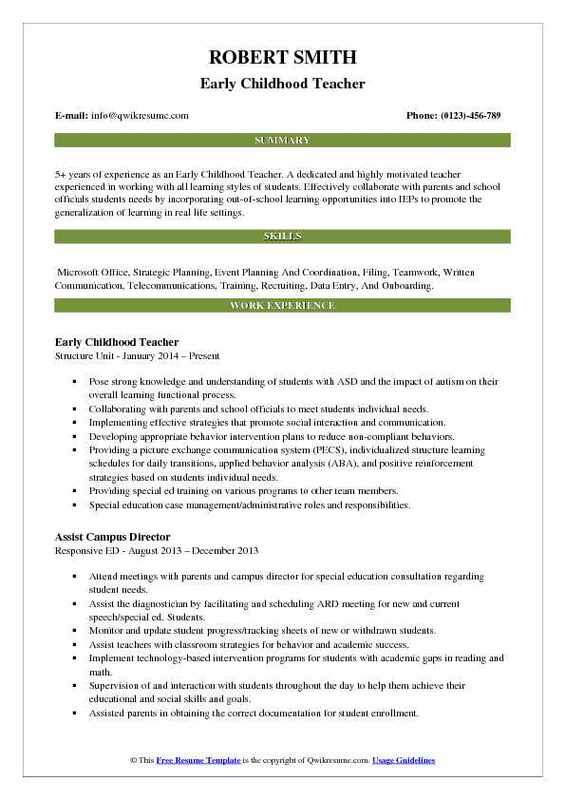 Skills : Strong Rapport With Students/Clients, Excellent Communication, Time Management Proficiency, Microsoft Office, Google Docs, And Google Sheets. Provided assistance and support to the children's family members as questions and concerns arise. Ability to have difficult conversations with children's family members as situations come up either face to face or over the phone. Adapt quickly to changing policies and procedures to assist parents and co-workers with the change. Have a compassion for early education and helping children grow based on their learning style as well as their development stage. Created lesson plans on a weekly basis to ensure up to date learning and creativity. Created daily and monthly reports on what each individual child has learned. Open communication with coworkers to ensure that the classroom is running to state guidelines and best practices. Utilize Microsoft office to communicate through email to colleagues, managers and the parents. Maintained a safe environment to enhance children's development and learning experience. Knowledgeable and aware of signs of child abuse and reporting procedures. 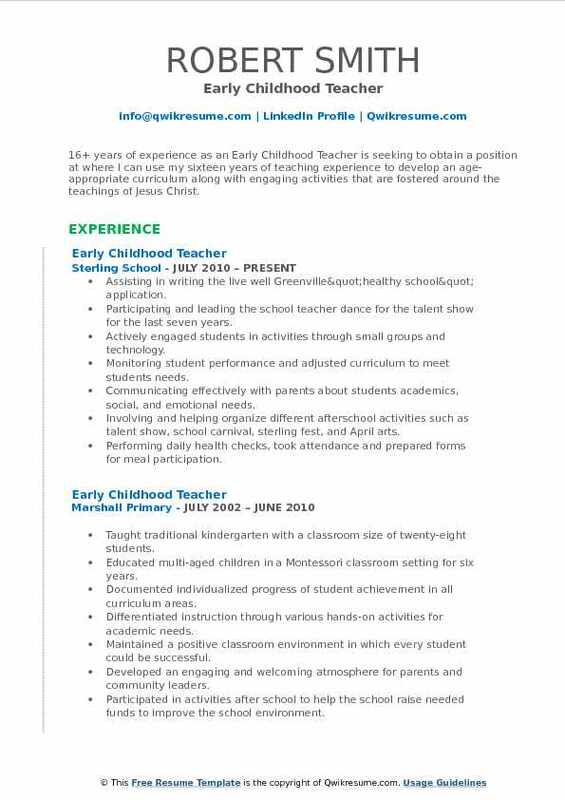 Summary : 11+ years of experience as an Early Childhood Teacher is seeking to secure a position in an organization that is challenging and offers an opportunity for progression and development within my career while serving as an employee to the best of my capabilities. 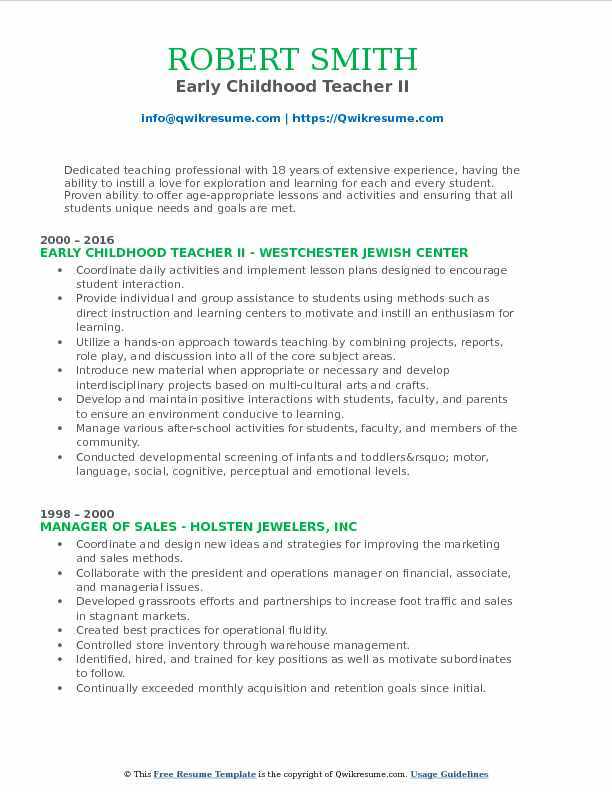 Skills : Early Childhood, Teacher Assistant, Child Development, Child Care, Trained Modern, Ballet, Jazz, Swim, Previous Lifeguard, And Avid Exercise Enthusiast. Establish effective classroom operation and curriculum programs for all classrooms in the entire learning center by using my classroom as a model. Present numerous promotional ideas and strategies to help increase enrollment in the learning center, such as networking opportunities and advertising tactics. Well-organized, detail-focused, and able to control a large group of young children while creating an environment conducive to learning. Create, organize, and maintain individual student assessment portfolios; including a skills checklist, classwork samples, and narrative progress reports; also used to conduct quarterly parent/teacher conferences. Plan and implement weekly lesson plans that include activities to develop and promote problem-solving, academic skills and developmental growth. Successfully utilize learning centers for reading, writing, science, math, and technology to complement the child-based, hands-on curriculum. Support the director and operations manager, as needed, with administrative and clerical tasks, such as answering a 6-line telephone system, call transfers and call pages, copying, collating, faxing, writing formal letters, receiving mail/deliveries, taking detailed messages, general organizing of office/classroom supply. Superior interpersonal and communication skills to promote meaningful relationships with children, staff, and parents. Headline : 5+ years of experience as an Early Childhood Teacher. A dedicated and highly motivated teacher experienced in working with all learning styles of students. Effectively collaborate with parents and school officials students needs by incorporating out-of-school learning opportunities into IEPs to promote the generalization of learning in real life settings. Skills : Microsoft Office, Strategic Planning, Event Planning And Coordination, Filing, Teamwork, Written Communication, Telecommunications, Training, Recruiting, Data Entry, And Onboarding. Pose strong knowledge and understanding of students with ASD and the impact of autism on their overall learning functional process. Collaborating with parents and school officials to meet students individual needs. Implementing effective strategies that promote social interaction and communication. Developing appropriate behavior intervention plans to reduce non-compliant behaviors. Providing a picture exchange communication system (PECS), individualized structure learning schedules for daily transitions, applied behavior analysis (ABA), and positive reinforcement strategies based on students individual needs. Providing special ed training on various programs to other team members. Special education case management/administrative roles and responsibilities. Summary : 16+ years of experience as an Early Childhood Teacher is seeking to obtain a position at where I can use my sixteen years of teaching experience to develop an age-appropriate curriculum along with engaging activities that are fostered around the teachings of Jesus Christ. Skills : MS Office, Access, CPR, Web Design, Illustrator, Budgeting, Mentor, Teaching, And Child Development. Assisting in writing the live well Greenville"healthy school" application. Participating and leading the school teacher dance for the talent show for the last seven years. Actively engaged students in activities through small groups and technology. Monitoring student performance and adjusted curriculum to meet students needs. Communicating effectively with parents about students academics, social, and emotional needs. Involving and helping organize different afterschool activities such as talent show, school carnival, sterling fest, and April arts. Performing daily health checks, took attendance and prepared forms for meal participation. 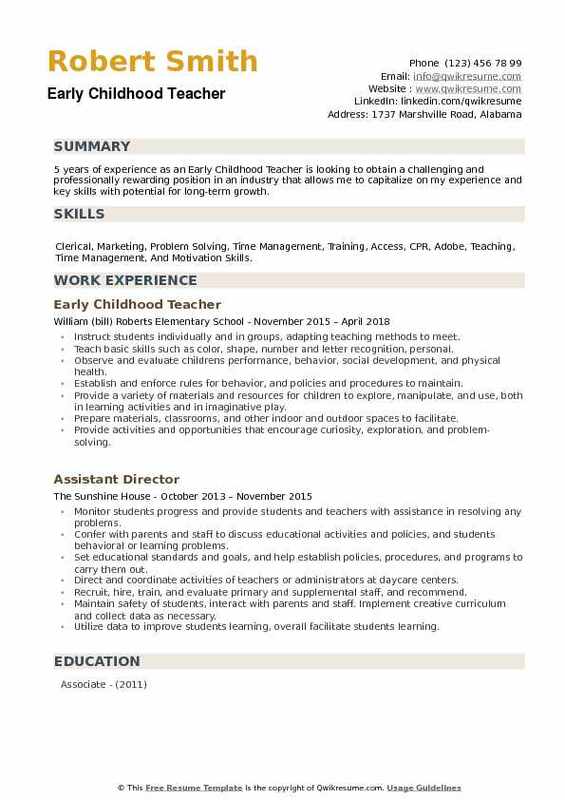 Summary : 13+ years of experience as an Early Childhood Teacher. I am interested in assisting or leading in a classroom/ school setting. Other areas of expertise include clerical work and case management. 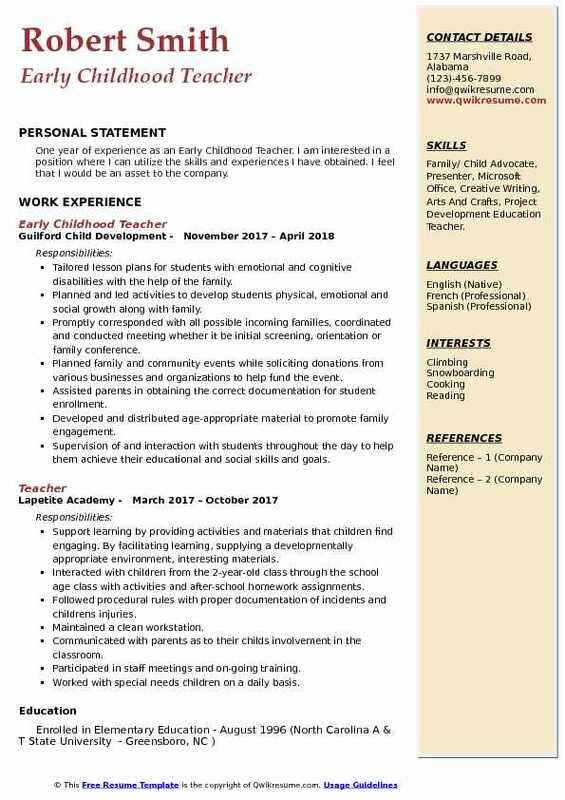 Skills : Microsoft Office, Google Docs, Google Sheets, Money Handling, Budgeting, Early Childhood, Child Development, Child Care, And Teacher Assistant. Caregiver creating and following an evening schedule for children, creating a safe environment. Supervising, redirecting behavior, teaching, filling out accident reports, communicating. Professionally with tx licensing, parents, and other personnel on a daily basis. Management: managing the office, accepting payments, answering phones, multi-tasking. Supervising employees, completing paperwork for enrollment, food program, etc. Custodial work: sanitizing all areas of work and play (including tables, floors, restrooms. Implement activities based on childrens individual differences resulting in enhanced learning and development. Summary : 12+ years of experience as an Early Childhood Teacher is seeking to acquire a challenging position that will allow me to utilize my skills and experience and would provide advancement opportunities. Skills : Early Childhood, Child Development, Child Care, Teacher Assistant, Trained Modern, Ballet, Jazz, Swim, Previous Lifeguard, Avid Exercise, And Enthusiast. Designing age-appropriate lesson plans and activities that teach academic and fundamental socialization skills which encourage physical, social, emotional, and cognitive growth. Set up age-appropriate learning centers to promote life-long learning experiences. Teach and facilitate small group experiences which are based on thematic units. Implementing classroom discipline to ensure the safety of all children and staff and put behavior modification plan in use when necessary. Maintaining skills checklist and routine assessments to keep track of each child's developmental progress. Participating in parent-teacher conferences and home visits to keep parents informed on each child's developmental progress and to promote education in the home. Providing a nurturing and structured learning environment to meet the needs of each child. Summary : Dedicated teaching professional with 18 years of extensive experience, having the ability to instill a love for exploration and learning for each and every student. Proven ability to offer age-appropriate lessons and activities and ensuring that all students unique needs and goals are met. Skills : Access, CPR, MS Office, Web Design, Adobe Illustrator, CSS, Teaching, Patience, Motivational Skills, Interpersonal Skills, And Budgeting. Coordinate daily activities and implement lesson plans designed to encourage student interaction. Provide individual and group assistance to students using methods such as direct instruction and learning centers to motivate and instill an enthusiasm for learning. Utilize a hands-on approach towards teaching by combining projects, reports, role play, and discussion into all of the core subject areas. Introduce new material when appropriate or necessary and develop interdisciplinary projects based on multi-cultural arts and crafts. Develop and maintain positive interactions with students, faculty, and parents to ensure an environment conducive to learning. Manage various after-school activities for students, faculty, and members of the community. Conducted developmental screening of infants and toddlers’ motor, language, social, cognitive, perceptual and emotional levels. 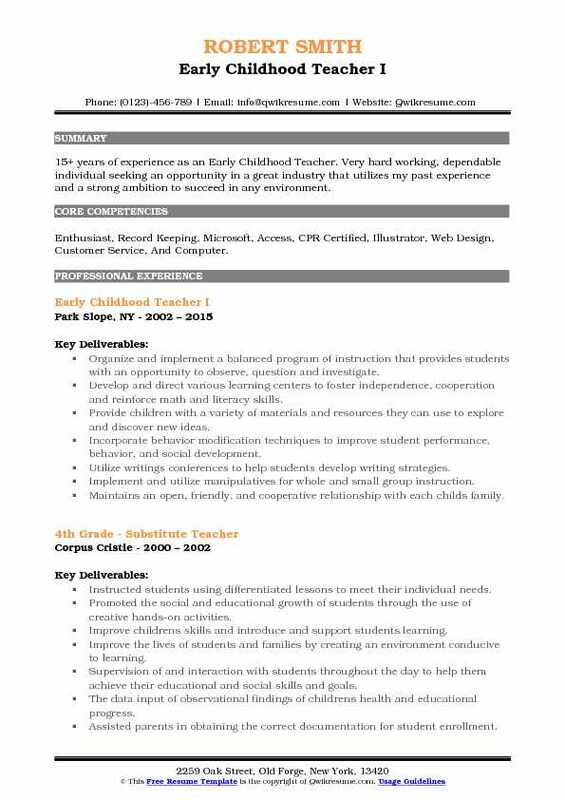 Summary : 15+ years of experience as an Early Childhood Teacher. Very hard working, dependable individual seeking an opportunity in a great industry that utilizes my past experience and a strong ambition to succeed in any environment. 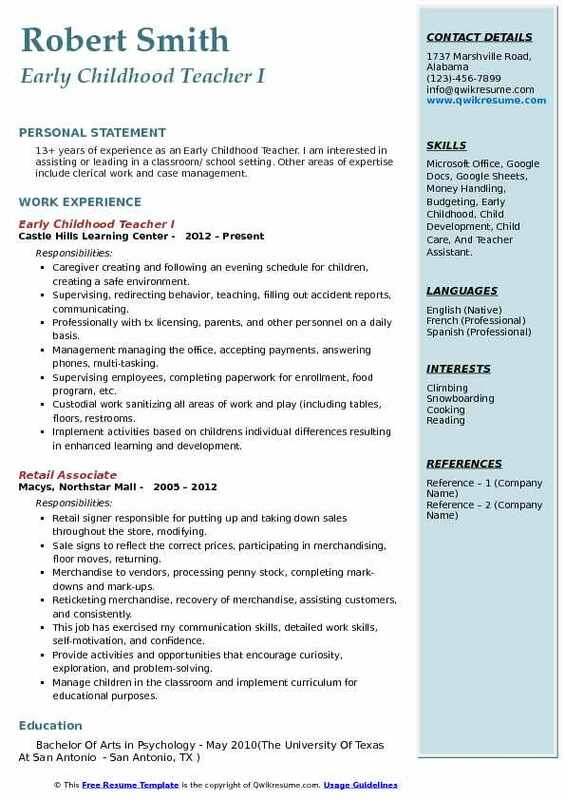 Skills : Enthusiast, Record Keeping, Microsoft, Access, CPR Certified, Illustrator, Web Design, Customer Service, And Computer. Organize and implement a balanced program of instruction that provides students with an opportunity to observe, question and investigate. Develop and direct various learning centers to foster independence, cooperation and reinforce math and literacy skills. Provide children with a variety of materials and resources they can use to explore and discover new ideas. Incorporate behavior modification techniques to improve student performance, behavior, and social development. Utilize writings conferences to help students develop writing strategies. Implement and utilize manipulatives for whole and small group instruction. Maintains an open, friendly, and cooperative relationship with each child's family. 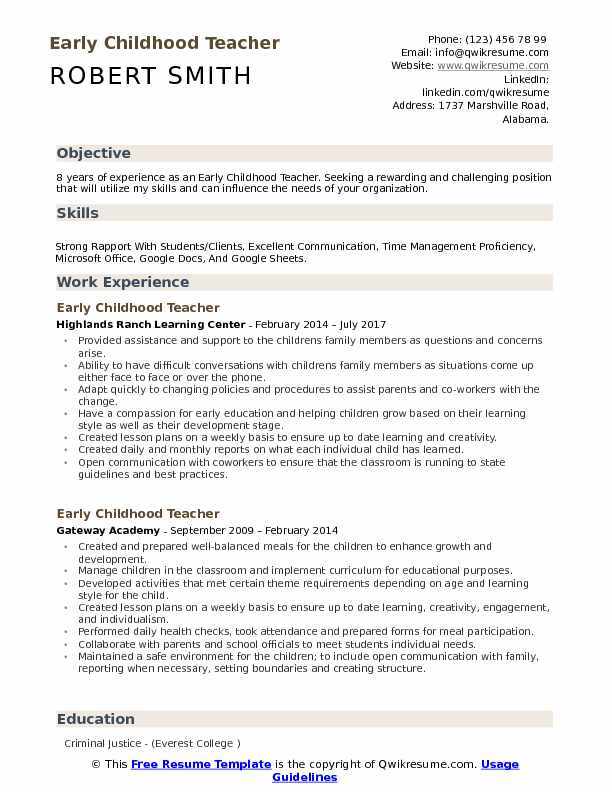 Objective : One year of experience as an Early Childhood Teacher. I am interested in a position where I can utilize the skills and experiences I have obtained. I feel that I would be an asset to the company. Skills : Family/ Child Advocate, Presenter, Microsoft Office, Creative Writing, Arts And Crafts, Project Development Education Teacher. Tailored lesson plans for students with emotional and cognitive disabilities with the help of the family. Planned and led activities to develop students physical, emotional and social growth along with family. Promptly corresponded with all possible incoming families, coordinated and conducted meeting whether it be initial screening, orientation or family conference. Planned family and community events while soliciting donations from various businesses and organizations to help fund the event. Assisted parents in obtaining the correct documentation for student enrollment. Developed and distributed age-appropriate material to promote family engagement. Supervision of and interaction with students throughout the day to help them achieve their educational and social skills and goals. 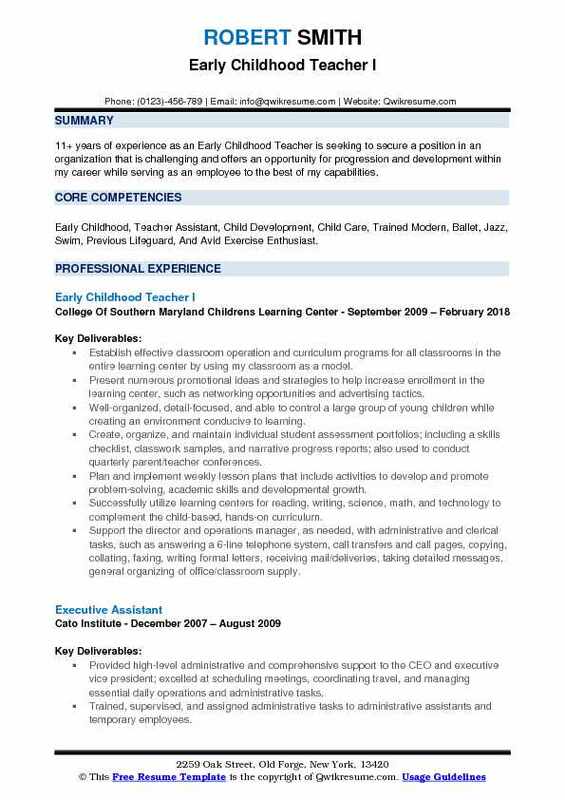 Objective : 5 years of experience as an Early Childhood Teacher is looking to obtain a challenging and professionally rewarding position in an industry that allows me to capitalize on my experience and key skills with potential for long-term growth. Skills : Clerical, Marketing, Problem Solving, Time Management, Training, Access, CPR, Adobe, Teaching, Time Management, And Motivation Skills. Instruct students individually and in groups, adapting teaching methods to meet. Teach basic skills such as color, shape, number and letter recognition, personal. Establish and enforce rules for behavior, and policies and procedures to maintain. Prepare materials, classrooms, and other indoor and outdoor spaces to facilitate. Provide activities and opportunities that encourage curiosity, exploration, and problem-solving.